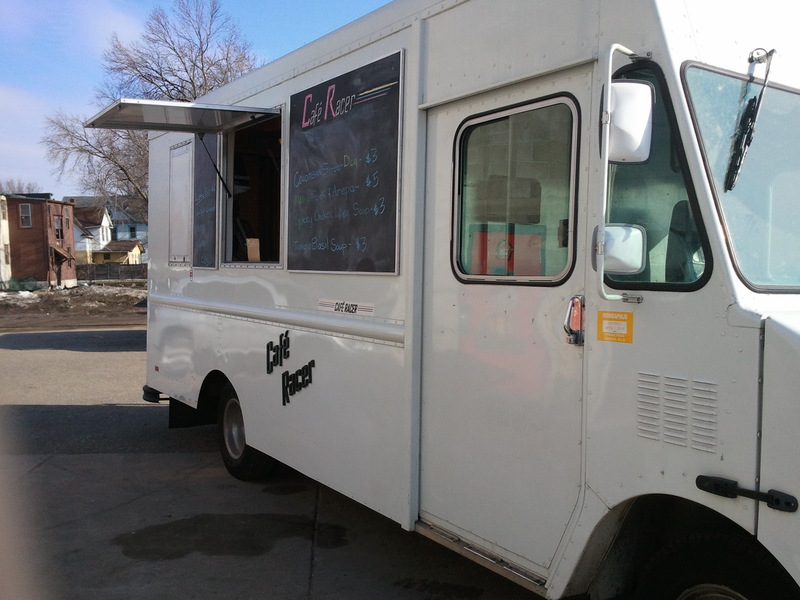 Deciding to launch their Food Truck in October, also known as the complete and utter end of Minnesota’s yearly street food season, Café Racer opened themselves to be described a single word: Ballsy. Not even starting this blog until recent January, it has taken me four whole months to notice a reasonably accessible post and event from them on Roaming Hunger. That said, it was a fun find Wednesday morning, and at quarter to 5 I popped in my car and headed down to Harriet Taproom for my first taste of them. 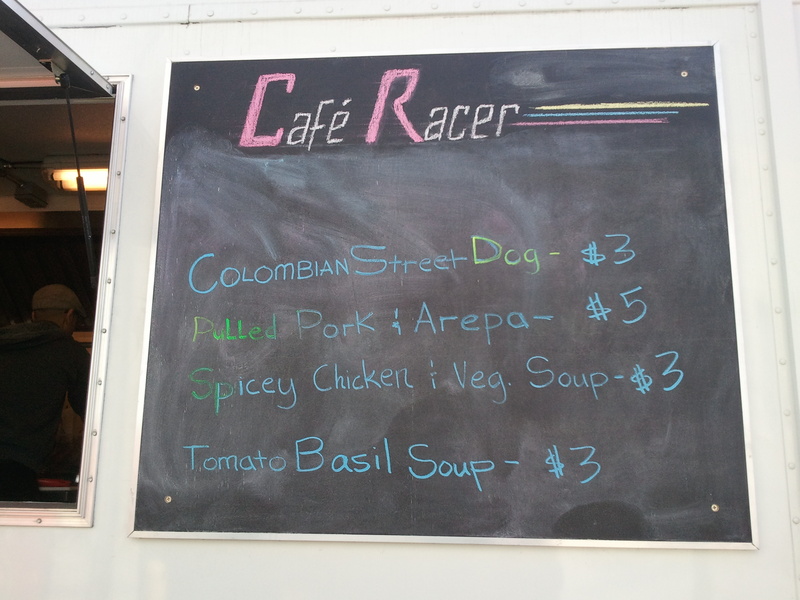 Inspired by Colombian and other Latin cuisine, Racer a few different items depending on the event. Main options generally focus on their pulled meats, offering some form of sandwich, or in my case arepa, and “Entree,” basically a plate of said meat served with rice, chips, and some other side. The Columbian Street Dog, topped with sweet peppers, green and pink salsas, and queso fresco, has become a mainstay, along with their hand-fried potato chips they top it with. 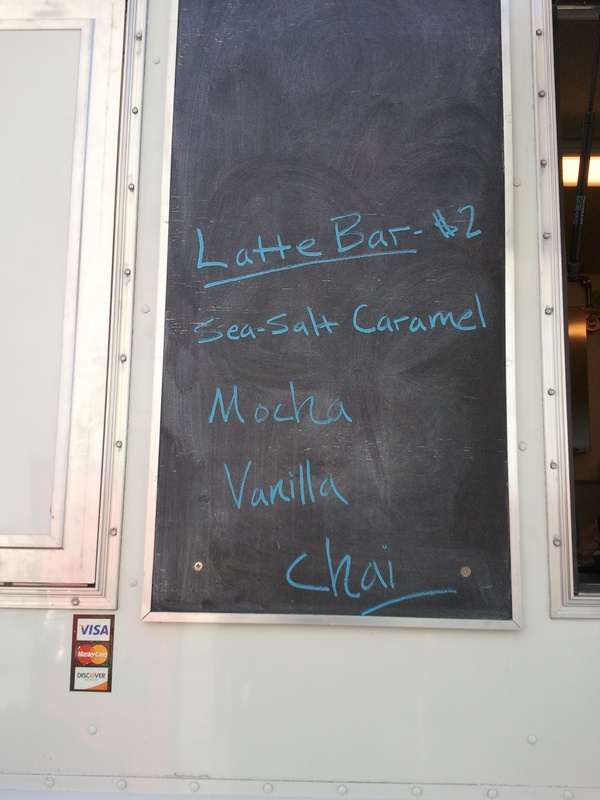 Depending on the weather, one can also find them serving up flavored lattes to order; I got a sea-salt caramel. Well, after finishing my glass of Harriet’s IPA. Outside of the food, I ended up staying around for some conversation. That’s where I learned that, besides being the Secretary-in-Chief of our recently created Food Truck Association (he was one of the people talking about the idea before Zimmern’s lawyer actually put it all together), the owner and employees of Café Racer actually own a shop that builds Food Trucks (it’s no wonder he’s in the business). For those reading who are not currently shoving themselves back in their chair with their mouth open, let me tell you why this is a big deal. Some may find this surprising, as I did, but the number of places within the ENTIRE country that actually build Food Trucks are extremely limited; like, single digits… and not the high ones. In fact I’ve heard that most US Food Trucks all get theirs from the same area out in California or some other Western State. So to hear that we in MN have our own shop for it… well that is just a thrilling thing, just another sign at how much our culinary and street food culture is growing. Pork is their specialty, and it’s no wonder why. 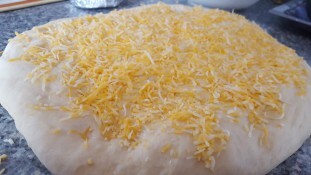 Cooked without anything but basic seasoning, it ends up perfectly moist and full of its pure, natural flavor. 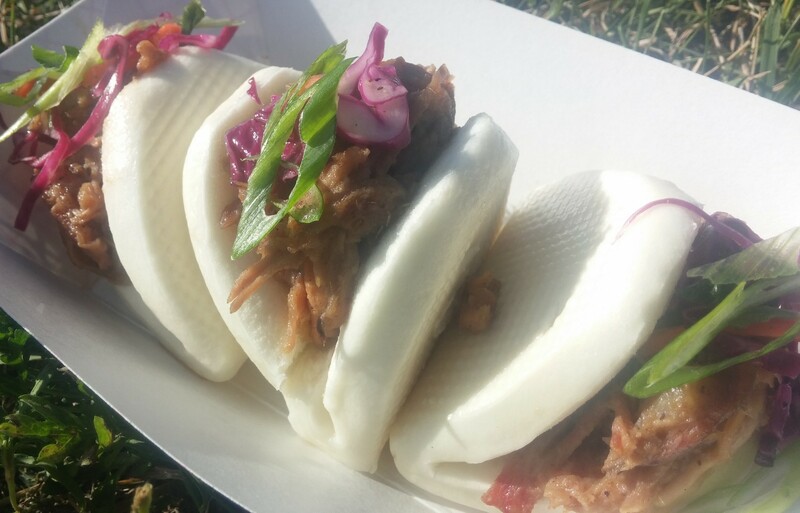 Not very surprising that CityPages named their Pork Plate among their top 50 dishes. With it not being on their menu, along with a simple sandwich form, I decided to try their Arepa. The name itself already made me nervous, as those of us with even the most basic familiarity with the Food Truck scene know the high standard that Hola Arepa has created for this particular product. I ended up pleasantly surprised and happy, though, as they decided to take a completely different way of presentation. Instead of the traditional English-muffin-like cake, they take the masa dough and just pound two flat circles onto the griddle to crisp. Thus giving you two thin patties of sweet, savory corn to use like a taco shell, building your own little handheld sandwiches. Then one has the pickled onions, which unlike all other trucks don’t just keep them in the pickling for weeks on end. Briefly marinated, they hold that nice crisp bite and pit of pungency while bringing that tight, flavorful acidity. Though I didn’t have a chance to try, one of their more interesting items are the Carrot Souffles, used as a popular side item for the entrée and other plates. Considering their size, I was quite intrigued to find out that they actually WERE soufflés, baked in tiny muffin tins, as opposed to some other item that could be called as such (you know places that do it). 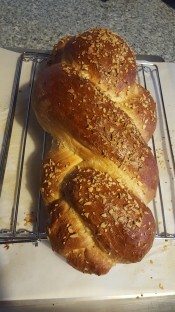 I certainly give them applause in making it, and suggest people give them a try (from the description of ingredients, it sounds delicious). Despite not having it, I’m also quite sure of the tastiness in their Columbian Dog, the particular flavor combination being very reminiscent of top-quality hot dog vendors, not to mention Latin palettes. Here’s my grief. From what I can tell, all food items are cooked properly and very well. But, both eating through the Arepa and looking at the Pork Plate, I can’t help but feel they both need… SOMETHING. The pork is rich and flavorful for plain pork, but it’s just not enough, and the rest of the ingredients only bring in some filling and some iotas of flavor and acid. 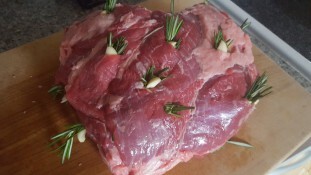 It’s all tasty, but it needs something like a sauce to bring in flavors, complexity, extra moisture, spiciness, etc. Though this might not be far off; I mentioned to him my interest covering the pork plate in a good salsa or mole verde and adding a poached/soft-boil egg and found that they’re looking to explore breaking into the breakfast scene. When they do (and I know they will), I’m sure their dishes will be balanced exactly how they should be; until then, ask for some salsa when you get a pork dish. Besides that, though the latte is nice (they actually serve it at the proper temperature, so you don’t burn your tongue on the first 10 sips), but it doesn’t feel all that special… maybe I’ll try the Chai next, see if that changes. Chips are sort of fun, they do a mixed combo of both sweet and regular potatoes, but they seem to have a tendency to over fry. Makes me half wish they ignored the sweet potatoes and just stick with the regular. 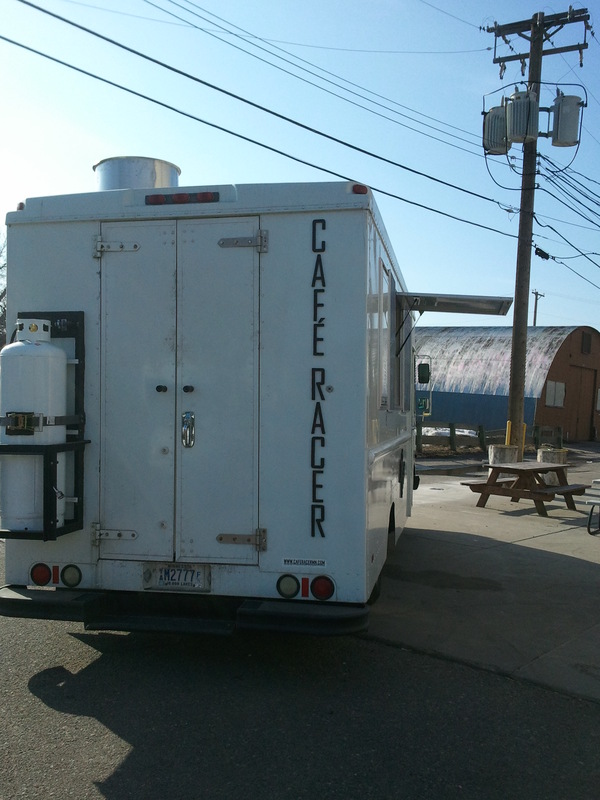 Note: Since my original writing of this review, Café Racer has continued to evolve and improve their items, along with their presence in the Food Truck World. Most notable of this has been a change with their Arepas, completely turning them into a sandwich and adding sauce and other toppings. The full details of it are Here, but suffice to say it is completely delicious, has that special something, and as a result of these changes I have decided to increase scores in Taste, Holdability, and Toe. Depends on the item. Hot Dogs, Sandwiches, and Lattes are of course easily handled. The main plates, though, require sitting down with a fork, being piled into one of those brown to-go boxes. 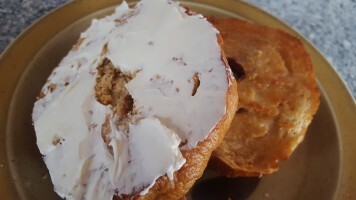 Even the Arepas, though hand-held in style, still require both hands and a sitting box to transfer from pork to “bun” so that you can eat; even then there’s often leftover plain pork. Definitely the best thing, besides the pork, about this truck. Though sandwiches and entrée plates can reach to $7 or 8, my visit found the highest option (the arepas) only at 5, with $3 soups and hot dogs (often sold for $6, but then you get two of them). Depending on the day visiting (menu items switch around), one could get an arepa, hot dog, and carrot soufflé side (only $2) for a solid $10. 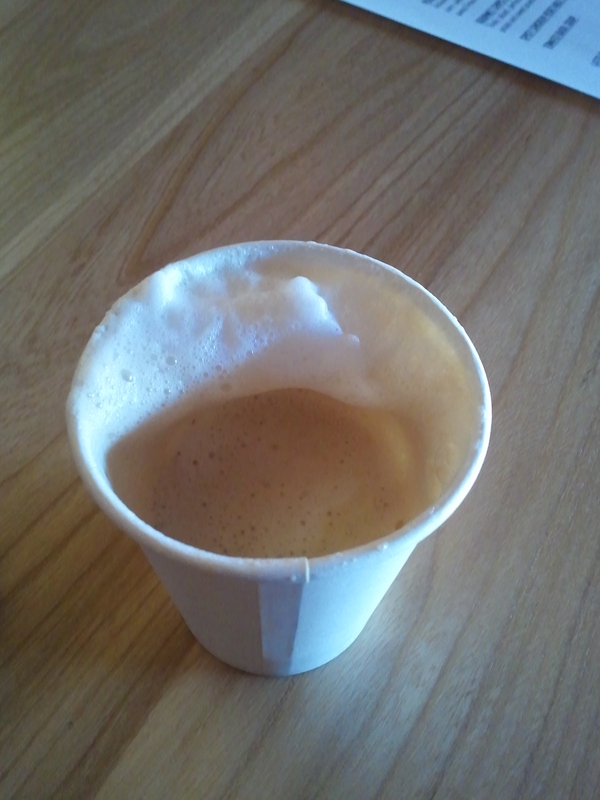 Lattes also $2. Only a bit over 3 minutes for my Arepa and the Latte, with all other items likely to be the same or less. The food is great, the dishes are unique and very reminiscent of the Columbian heritage they’re trying to express, but I just don’t feel they’ve quite reached their potential yet. I think once they work with some other Trucks and get that breakfast thing rolling, they might really find that pure niche and groove they’re owed. When they do, I certainly hope to be one of their first customers. The owner’s a very friendly and welcoming guy, really made the visit feel particularly fun. Every time we talked and I went silent he’d encourage me to keep going, and was very open to discussing the Association and other things in the field. They’re really good at expressing that feeling of hospitality, so for that I give a couple extra points. A good truck for 2 different Truck-goers. For those on a Truck-sampling day, or otherwise needing something small, cheap, and quick, grab the Columbian Dog for a fantastic item with all the flavors in one easy place. 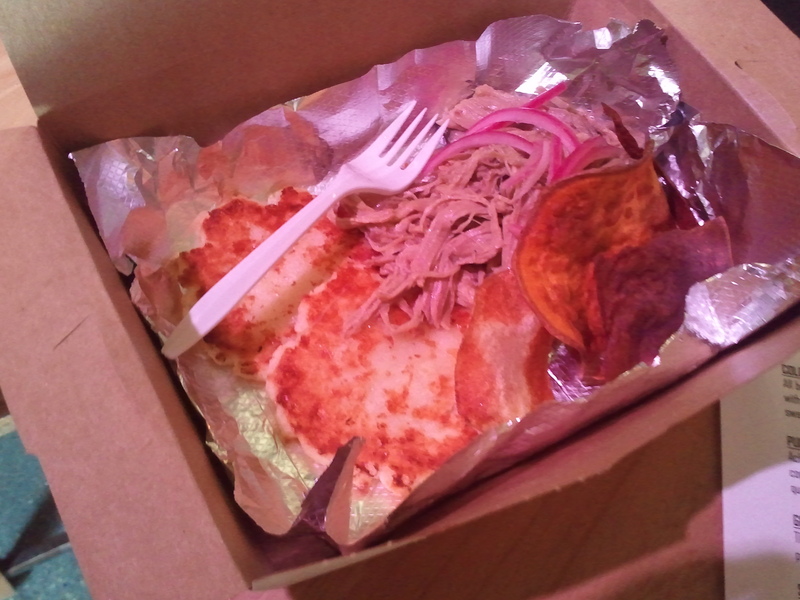 If at a Brewery or other sit-down location (able to bring back to work or sit on a bench for a while), then try one of the Pork dishes (especially the arepa, which can now be eaten much easier on the street). Just make sure you ask for some of that Pico Verde (or whatever salsa they have that day) on top if getting the entree. If possible, ensure that you get a side of those soufflés too. Everything else, I would probably ignore. This entry was tagged Beer, Brewery, Comfort Food, Hot Dog, Latin, Minneapolis, Minnesota, Pickles, Pork, Street Food, Tacos. Bookmark the permalink.